Written by Sarah Lazare, staff writer for Common Dreams. Published 10-14-15. The mother of teenage pro-democracy protester Ali Mohammed al-Nimr, sentenced to crucifixion by Saudi Arabia, pleaded with President Barack Obama to use his power to pressure the close U.S. ally to spare her son. Al-Nimr was arrested in 2012 when he was just 17 years old following his attendance of a rally for Shia rights in the eastern city of Qatif, according to his mother. After being denied access to a lawyer, al-Nimr was sentenced to death by beheading and crucifixion in May 2014 on charges that include taking part in demonstrations against the government and possessing a gun—the latter of which his family strongly denies. 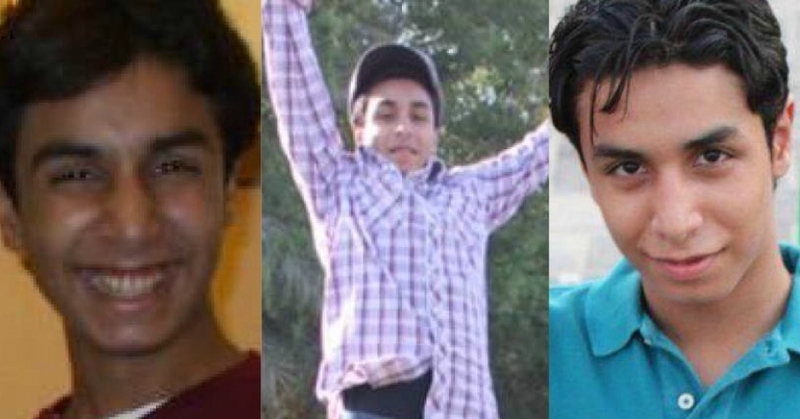 “The court seems to have based its decision solely on ‘confessions’ which Ali al-Nimr has said were extracted under torture and other ill-treatment,” noted Amnesty International. Al-Nimr is not alone. Dawoud al-Marhoon was also sentenced to die at the age of 17 under similar circumstances, and both executions are imminent. Between August 2014 and June 2015, at least 175 people were executed by the Saudi state after unfair trials, in a country where adultery is punishable by death and neither children nor the mentally handicapped are spared from execution. Al-Nimr’s case has shined a global spotlight on Saudi human rights abuses—within its own borders and around the world, including in Yemen where the state stands accused of numerous war crimes in its ongoing military onslaught. The pending execution has also called attention to the complicity of global superpowers that maintain close relations—and sell weapons to—the Gulf state, particularly the U.S. and UK. When questioned by a reporter last month, U.S. State Department spokesperson Mark Toner expressed “concerns” but declined to condemn al-Nimr’s sentence. He went on to “welcome” Saudi Arabia’s recent appointment to head a U.N. Human Rights Council panel. This entry was posted in Civil Rights, Government, Human Rights, Human Spirit, International Agreements, Social Justice, Solidarity, War Crimes and tagged Ali al-Nimr, Atrocities, Civil Rights, Human rights, Saudi Arabia, social justice, War Crimes on October 15, 2015 by MNgranny.